In the following article, we'll explore the Social settings that X provides in the WordPress customizer and how to configure them. Now to do this properly, you'd add the social URLs you want and fill them in correctly, as we just want to see the different icons here though, we're just going to enter a hash so the icons show up. Also in the Social section, is another setting called Open Graph, Open graph is used by Facebook and was originally created by Facebook, see here. 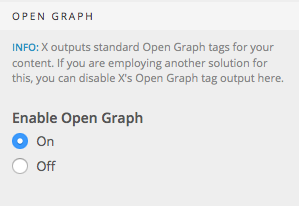 The option simply has a On or Off setting, by default it's on, you should leave it turned on, if you don't have another plugin outputting open graph data, if you do, you can safely turn it off from within the Customizer. Another Social Option provided by X, is the Social image fallback option. 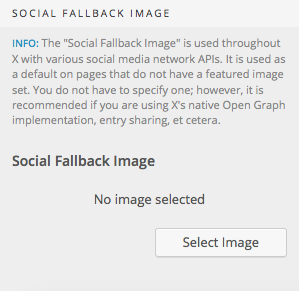 The Social Image Fallback is used on various social media API's for if a featured image isn't detected, it'll use the default media image, it's always worth setting this, so that a image is always shared, it's common for companies to use their Logo as the fallback image. Congrats! You've successfully set your social media URLs and have a greater understanding of the social options X provides.